CloudU Certificate? good but not for 2015! ~ Ahmed AbouZaid! Rackspace Cloud University, known as CloudU™, is a vendor-neutral, cloud education program designed by Rackspace and industry analysts. 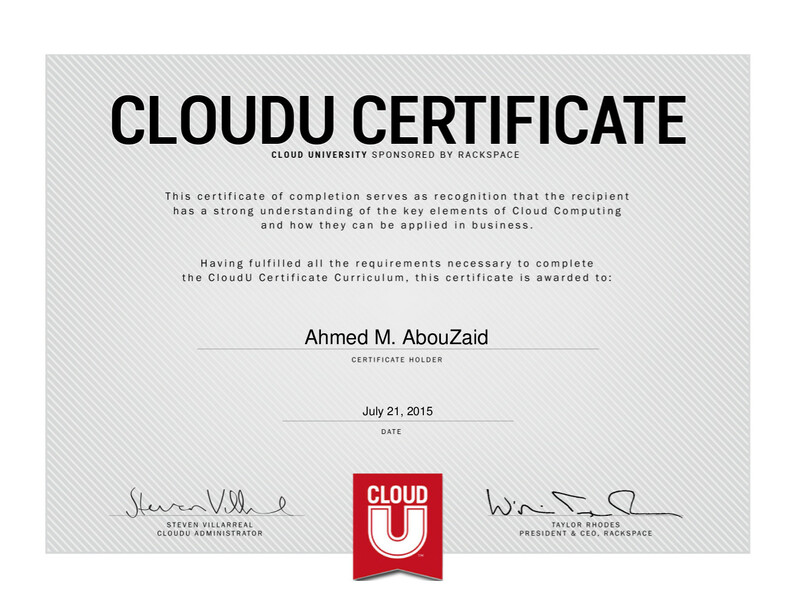 After you've earned the CloudU Certificate, check out the Award Winning Massive Open Online Course (MOOC) on Introduction to Web Hosting and The Big Data MOOC. CloudU is a vendor-neutral curriculum designed for business owners and technical professionals who want to bolster their knowledge of the fundamentals of Cloud Computing. At CloudU, you’ll find a comprehensive series of original whitepapers, live and on-demand webinars, events, blogs, videos and e-books aimed at increasing Cloud Computing knowledge among businesses. The program is a collaborative effort between Rackspace® Hosting and industry analysts. The content of CloudU isn’t vendor-specific. Anyone looking at moving to the Cloud, regardless of vendor or platform, can benefit from CloudU. I think this curriculum was great when it was introduced for the first time in 2011, at that time there were a lot of debates about "Cloud Computing", and all things related like Public/Privet/Hybrid Cloud ... etc. The curriculum is text based, abstract, and very theoretical! Any sysadmin can finish it within a couple of days or at the most one week. 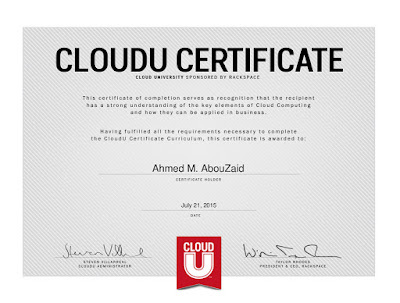 However it's good for anyone know nothing about Cloud Computing and want to get started with it. In fact I think this curriculum will be perfect for managers and sales representative!